Posted on 02/10/2012 by Stand and face the sun. I have studied with my teacher, Tim Miller many times and in many different places. I have been to Mexico to study yoga under a thatched roof that is 20 yards away from the Carribean Sea and I have studied in his hometown of Encinitas, CA, where his studio is also just a stretch from the pacific ocean and here in my hometown of Charleston, SC, with many beaches available. My 1st visit out West was to take his first series Ashtanga teacher training back in 2008. I remember going for my first walk on the beach and being challenged to shift my preconceived notions of what a beach is. I grew up having to travel to the east coast for some beach time, where the water is warm and sea shells are washing up on the beach everyday like individual precious reminders of the creation that’s going on under the sea. I would seek to collect memories amongst the vastness and variety of shells that would wash up on the beach. This was one of my favorite past times. Well, the Pacific isn’t anything like the Atlantic. The Pacific water is very cold. When I was there it was 54 degrees. It’s clearer than the east coast. You can see your feet getting bright red from the cold water, if your standing knee deep in the ocean. But the oddest thing to me was the lack of shells. Instead, what was scattered on the beach were stones – smooth stones, that varied in color and shape, but were all relatively similar in appearances. I was first disappointed, as I find it very meditative to walk a beach looking down at each step to see what washed up, artistically-crafted shell I can find. I can seem to do this for hours, peacefully. Since these stones were my only option I decided to start collecting them. Each one in my hand was different and when I stopped expecting them to be shells, I started to see the beauty in each one. The ocean had been rolling and polishing them to the smoothness and shape that made them each very individual. But, what was I going to do with a handful of stones? There is a practice of stacking stones in Buddhist cultures, where the stones are stacked as prayers. The number of stones might correlate to the number of family members. These stone prayers were stacked around temples. Closer to home, when I was young I remember being taught about hiking safety in girl scouts. We were taught to mark out trails using sticks or stones in the form of arrows to guide us safely back to where we began. You will see fancier renditions of this by some hikers who will opt to stack stones instead. I have hiked a few trails in my time and have come across these expressions. They always leave me wondering…How long had they been there? Who stacked these and why? How many other people had walked past and been intrigued by this natural art? So I decided to take a whirl at stacking stones, and it became a very interesting experience for me. I started with the collecting process, which naturally made me feel like a little girl again collecting things from nature. Carrying them back in the hem of my shirt, excited to see my loot dropped in a pile at my feet. I knew since I wasn’t going to spend a day frolicking in that very cold ocean, this could be a fun way to spend a day at the beach. So as I started to make a stack of stones, I kind of figured I’d do one, and that my attempt to balance stones would be a passing interest. But after I stacked one, I began the second, and then the third, until I had 5 stacks of stones. I started to enjoy the challenge of pairing the stones. The effort it took in patience to find the stones perfect balance point and the delicacy required to stack stone number 6 on number 5 without affecting all the stones below. You might get to stone 4 and knock them all down while adding stone 5. This process was slowly forming a very quiet space in my mind. I had begun to appreciation each stone’s character points that were ultimately going to influence their balance point. 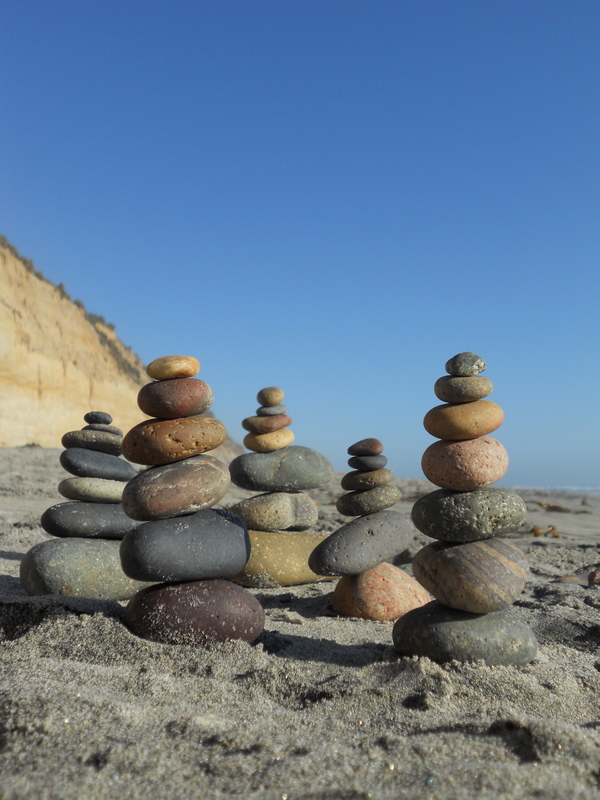 I started to see the parallels that stone stacking had to the alignment process of my bones in all the asana’s I had traveled out here to learn from my teacher’s 30+ years of experience. I remember a workshop I took within my first year of practicing yoga with Rodney Yee. I remember him demonstrating a pose called Trikonasana (three angled posture). He taught me a great lesson that day. It was the art of refinement. Small movements create a chain reaction in all areas of the posture’s alignment. Rodney Yee’s background was ballet. So he seemed to be demonstrating an impeccable understanding of his body and the ability to influence it’s alignment with a intelligent approach to movement, which was done without force. At the time, I am pretty sure that I was coming at my yoga practice with all braun and no grace. After seeing him make a few tiny movements and watching his posture go from what seemed disintegrated to integrated, it opened my eyes to a whole new approach to alignment. I had to find the balance point of each individual muscle and have the patience to allow all the muscles to work together with appropriate effort and sensitivity. Much like Patanjali’s yoga sutra 2:46 “Sthira Sukham Asanam” : Asana’s should have equal parts steadiness and ease. As you build a yoga posture, it becomes just like stacking stones. First you have to have a good foundation, which is why it’s just standard to do yoga on a firm service. Then you have to start from the bottom and work your way up. It begins in our feet, hands, arms or our sit bones (Ischial tuberosities). It really just depends on the asana that you are trying to build. It begins at the part of the body that will have the most contact with the floor. But what isn’t always paid attention to is that even once your foundation is set, the way you stack the rest of the stones/bones matters too. It’s the teeter totter principal. Too much weight in any one direction will throw off how the load is carried. As I am looking at each rock and feeling its weight and character in my hands, I have to try and feel for it’s balance point. I would roll the rock around to feel where it was heavy and to try and find a flat, smooth point. We can do this to with our bones by contracting back and forth between the opposing muscles that make the bone move in a given direction. The size and strength of a muscle can influence the impact it has on the movement of the bone. So you start to look for misalignments, areas where there is not equal movement. We all get the same muscles but we don’t all develop the same. Some of us have stronger abductors then adductors, or quadriceps vs. hamstrings, or core vs. back strength. These disproportionate make up is bound to create bad mechanics in our movements. But yoga is the process of tuning us into these things with awareness being the tool. Training our sense’s to feel more intimately stress and strain on the joints and ligaments. Sometimes, one of the only ways you can know what balance feels like is by pulling your body out of balance in both directions. Then start refining your movements slowly to where the center point lies. It’s the pendulum swing. Sometimes you have to try the good and the bad to find what is just right. It’s very much a Goldilocks approach to yoga. Is the porridge too hot, or too cold? Does my pose need more of this, or less? Looking for the greater then and less then symbol in each muscle to find the appropriate give and take to the movement you are trying to isolate. Give it a try: tilt your pelvis posteriorly, and then try and tip anteriorly, and then try and negotiate the neutral point, where there is no stress on the pelvis as it comfortably holds a neutral position. There was an interesting scenario that happened a couple of times when I was trying to stack the stones. Even though 5 stones seemed perfectly balanced if I placed the 6th stone wrong it caused the other stones to misalign. This is what is going on in our bodies everyday, under our skin, beneath our muscles. There is disintegration instead of integration. My teacher, Tim, likes to talk a lot about integration. It’s a great word to describe a balanced yoga posture. If we pick up a bad pattern of movement in our hip, it can create a reaction outward from there. An example is, if the hip is not functioning optimally, then it may create a strain and weakness in the knee. Or, it can create a imbalance all the way up in to our shoulder eventually affecting our neck. 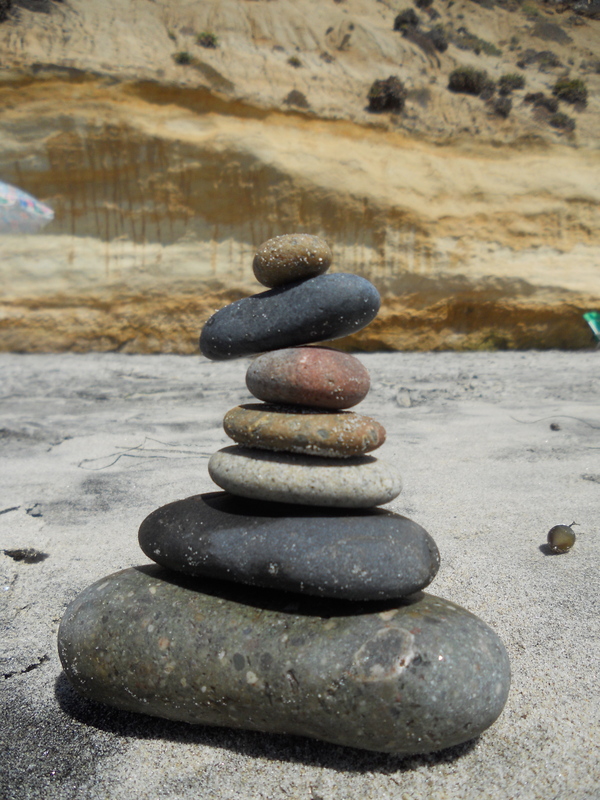 You could relatively look at areas of the body as representations of each stone you are trying to stack. 1st stone – ankles, 2nd stone – knees, 3rd stone – hips, 4th stone – lumbar spine, 5th stone – thoracic spine, 6th stone – cervical spine, and 7th stone – the head. It’s not only about the bottom stone/bone, it’s about how they all work together and distribute their weight on one another. It took me about 2 hours to collect and balance 5 towers of stone. And in that time, I learned a lot about my level of patience. I learned that speed does not assist delicate things well, and that force will not create balance, and that center isn’t as it outwardly appears. Center is where things meet, they don’t compete and they seem harmonious. Can I describe yoga asana’s that way? I can now. During my attempts at asana’s, day in and day out, I am looking for a point of balance that I feel my way into patiently and gently. When I move this way the poses that I’m striving for comes surprisingly easy. So, I say : if your having a hard time with your asana development, then take a break and go stack some stones, and see what you can learn. Then go back and try and stack your bones with the same interest, sensitivity, kindness and maybe even a little prayer while you do it. Stacking stones on a hiking trail will always get you back to the beginning. Maybe reminding ourselves of how far we have come from that beginning by looking back down the trail for the markers will give us a greater appreciation for our progress and abilities. Stop on this yoga path every now and then and stack some stones so that you don’t lose your way by being clouded with frustration and lack of patience. Pattabhi Jois said “Practice…and all is coming. ” Whatever it is we practice, stacking stones or stacking bones?